Next month SBS favourite Luke Nguyen returns in a new ten part series, Luke Nguyen’s United Kingdom. While the title might be stretching ‘ownership’ a little, I’m sure the cuisine discoveries will be scrumptious, uncovering the best of British tradition with a fresh, modern Asian twist. “During this incredible journey, I met many wonderful characters and discovered many amazing locations throughout the captivating and diverse regions of the UK. I love the emphasis the Brits put on creating foods that are literally steeped in hundreds of years of tradition yet today are reflecting of a new emerging food culture. I also learnt so much about the history of this extraordinary island and the level of influence it has had on food cultures and cuisines around the world. I am thrilled I can now share my UK journey with the SBS audience,” he said. Over ten half hour episodes, Luke ventures through the intriguing countries and places that make up the UK beginning with London, now widely acknowledged as one of the world’s great food capitals. He then heads southwest to the breathtaking counties of Wiltshire and Hampshire where he is taught how to cook an authentic ‘Lardy Cake’. Amongst the crystal clear waters and towering cliffs of Cornwall, Luke hops on a local fishing boat to catch the freshest seafood then learns the secrets of the traditional Cornish pasty. After exploring the southern counties, Luke ventures north into Wales and uncovers the new craze of pop-up restaurants sweeping the UK. Next it’s into the fresh crisp air of the Welsh countryside as Luke is taught fly-fishing. Heading north through the breathtaking Lake District in Cumbria, Luke meets a very special lady whose passion for Cumbrian inspired food was rewarded with an OBE from the Queen. Completing the northern leg of his journey Luke arrives on Scotland’s stunning Isle of Bute, where he chases succulent langoustines, goes foraging through the local clear coastal waters collecting seaweed and explores one of the most significant houses in Scotland. Then travelling eastward Luke heads to the Scottish capital, Edinburgh, where he checks out the historic landmarks, Scots Monument and Edinburgh Castle. To conclude his Scottish adventure Luke indulges in the finer side of Scottish cuisine as he is treated to a whiskey tasting in the famous five-star Balmoral Hotel then is shown how to make the famous Scottish delicacy haggis. On the return leg Luke winds his way southwards through the picturesque countryside of historic Northumberland and is entertained by the gracious Duchess of Northumberland. After an enthralling tour of the ‘poison garden’ in the grounds of her home, Alnwick Castle, Luke cooks a crisp salad dish for the Duchess using locally grown fresh produce. Still in Northumberland but heading further south Luke has to visit the world famous Roman structure ‘Hadrian’s Wall’ where he takes the opportunity to cook a recipe on the wall fit for a Roman centurion. Amongst the rich 19th and 20th century architecture Luke meets Manchester’s ‘Mr Pieman’, who, unbeknown to Luke, was inspired by his Vietnamese Pho recipe to produce the first and now very popular ‘Pho pie’. Next on the list of must visits in Manchester is the Chop House Public House where Luke learns how to cook the local dish corned beef hash and he then explores one of Manchester’s busiest restaurant strips, the Curry Mile. On his return to London Luke discovers the unusual, the interesting and the famous, which encompasses the food landscape right across the UK. 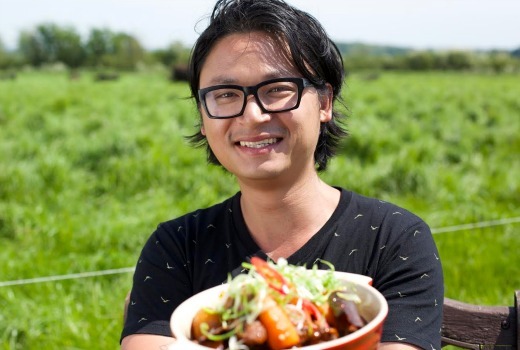 Following the popular fifth series, Luke Nguyen’s France, which explored the culinary influences that shaped Vietnam, Luke’s ancestral home, this new series peels back the layers of the UK’s surprising food identity. With his heritage never too far away, coupled with his passion for food, Luke unearths the multicultural diversity that has changed the tastebuds in today’s modern United Kingdom. Thursday 14 May at 8pm on SBS ONE.